This could be the stupidest conceit of today’s Israel-haters: that they are breaking the silence, speaking out in a fresh and original way, daring to say things that others may be thinking but fear to put into words because of the terrible retribution of the Zionist conspiracy, which will destroy them by branding them as antisemites. 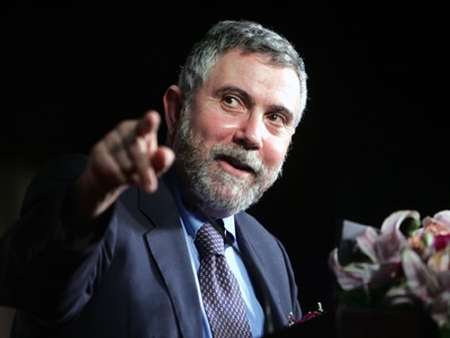 I’m actually embarrassed for Krugman. It seems to me that the industry of bashing Israel is alive and well in many places, especially his own NY Times, home also to such ‘brave’ men as Thomas Friedman, Roger Cohen, Nicholas Kristof, etc. who face the Zionist buzzsaw without flinching week in and week out. It’s not as much brave to pick on Israel as it is profitable. Who ever heard of Peter Beinart before he adopted the persona of Brave Jew Standing Up to Powerful Zionist Establishment? Maybe Krugman should spend some time thinking about where Israel is going, because an honest effort to do so would require that he learn something about it. Beinart’s work of fantasy won’t be much help there. This entry was posted on Tuesday, April 24th, 2012 at 10:05 pm and is filed under General. You can follow any responses to this entry through the RSS 2.0 feed. Both comments and pings are currently closed. It has now become an Industry: ” Liberal Jews who save Israel from itself” In fact along with Krugman the ‘Times’ features another such article today by one Sam Roberts. But of course this is the official line not only of Tom Friedman and Roger Cohen but ‘Times Editorial’ itself. It commissions tens of such articles every year. They all should be ashamed of themselves. They are fools who put their heads in the sand about Palestinian Arab intentions and actions. Their one- sided blaming of Israel when it really deserves one- sided praise is as you say ‘self- serving’ Shame shame on them all.